If a game is likely to last longer than five minutes, then I want to learn something from it. For this reason, I can’t abide Fluxx or any of its myriad progeny. I love to play, but struggle with the idea of time spent unproductively. Thankfully, productive play is very much possible. However, to what extent does the game as a learning tool imply a teacher? If the game designer is to be cast in this role, to what extent does he or she bear responsibility that what is learnt is not fallacious? Broadly, not exhaustively, two chief kinds of learning appear to emerge from playing a strategy game: the learning of facts, and the learning of processes. I will address the former today, and the latter in the near future. The former category may appear the most straight-foward: a game should be accurate on points of fact. However, this ostensible simplicity can be deceptive. Accuracy and the play experience can often stand at odds. Indeed, though it might seem initially perverse, I think it is often the case that those factual inaccuracies which least affect gameplay are the hardest to accept. I think players will tolerate certain orders of deviation from reality if they can be seen to enhance the experience a game provides. 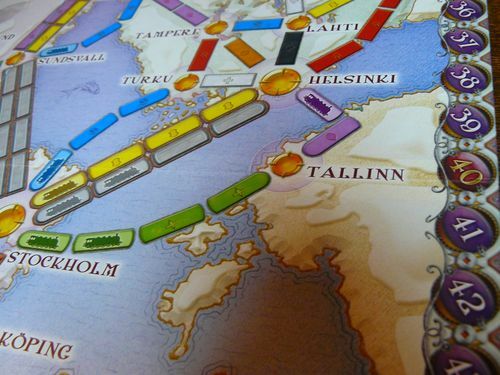 For instance, this thread on Board Game Geek reveals how few of the rail and ferry routes represented in Ticket to Ride: Nordic Countries existed in 1910, the year in which the game is set. Many (according to those posting, at least) have simply never existed up to the present day. However, the game is widely praised, with many commentators finding the map ‘tight,’ and praising the ‘cut-throat’ two player game it generates. It defies credibility to suppose that the same region of the world, represented using only genuine connections, should have produced as rewarding a player experience. The designer (Alan R. Moon), has departed from reality for the sake of the game. By contrast, Ian Vincent, the designer of Ticket to Ride: India, reveals in a design diary that the connections depicted in his iteration of the game are almost entirely accurate. However, this is only true in the sense that the game represents railway connections which existed in the year 1911: Vincent’s source map depicts many railway routes which are not reproduced in his entry to the Ticket to Ride series. Moreover, while the India map has been well-received, it’s probably little surprise that it is the balance of the game, and the freshness of the experience the map offers which have been praised. The accuracy of the map is not celebrated at all. Thus, it appears that the nature of the play experience these games provide is more important than their accuracy,at least judging by their popular reception. In that Ticket to Ride tends to be perceived as a lighter game, it might be that it is approached with a forgiving mentality with respect to its factual correctness. I’m not sure. I doubt, thought I concede the example feels silly, that it would be seen as justified if a Ticket to Ride game were to invent a new city for the sake of balancing a map. Indeed, extending from this, I think there exists a complicated contract with respect to the degree and nature of the deviations from fact which might be felt to be acceptable in a game. An imagined route – in any game – is not a great worry, whereas an imagined city (in a real-world game) would irk most players. I think on any given point, the nature of the agreement on accuracy between player and designer is more easily felt than defined. To ask designers to be alert to a nebulous feeling of acceptability may sound weak, but I think there’s much that is commonly accepted with respect to what is and is not acceptable. Of course, this entwines with the scepticism brought to the learning experience. I’d feel betrayed if, after playing Ticket to Ride: Nordic Countries, I learnt that Honningsvåg and Lahti had just been invented to fill spaces on the map (they haven’t, unless there’s a vast, weird Nordic conspiracy afoot throughout the internet). By contrast, I don’t particularly care if I can travel between the two by train or not (or whether I could have 100 years ago). I doubt my feelings are exceptional in this respect. This all said, a game which contains errors which do not directly affect gameplay cannot typically use a justification which appeals to the player experience. Such inaccuracies are therefore more unquestionably troubling. For instance, Labyrinth: The War on Terror, 2001-? (which I have commented on before), uses a map with numerous errors, including depicting a still united Yugoslavia and Soviet Union (though these problems have been addressed with the most recent printing). 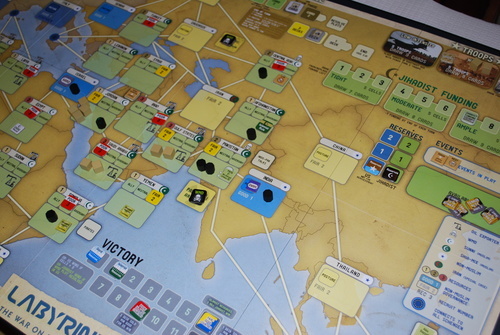 The mistakes in question have no direct effect on the game (neither Yugoslavia nor the Soviet Union can be controlled), but are distracting, and speak of a design team unengaged with the world about which they are supposedly communicating something. Another issue is that of the frequent impossibility of comprehensiveness. A board or card game, by its nature, can only provide a limited amount of data: with respect to most possible items, comprehensiveness is not possible. A game with a map must exclude certain cities, while a game with covers an historical period could not, of course, hope to address all of its events: the card-driven Twilight Struggle, for instance, inevitably omits more of the story of the Cold War than its cards manage to tell. Even 1989: The Dawn of Freedom (the recent successor to Twilight Struggle), with its much narrower focus, is poorly able to tell the story of that year, limited as it is to 150 or so cards as its medium. However, it is clear in these games that the information is offered as partial, and therefore should be received as such. That they tell something should be commended: that they exclude is inevitable – though exclusion raises issues of balance, with respect to which sides of the story are left out. More problematic, perhaps, are those games which appear to be comprehensive with respect to a given point, but do not quite succeed in being so. 10 Days in Europe, for example, in which players tour the countries of the continent, marks many of Europe’s micronations on its map (including, to a pedant’s dismay, the non-sovereign Gibraltar), but excludes them from gameplay. However, Malta is missing from its map entirely (as well as Cyprus and the Caucasian countries – though their geographical place in Europe is disputed by some) . Similarly, 10 Days in Africa includes only Madagascar of that continent’s island nations (thereby missing Cape Verde; the Comoros; Mauritius; São Tomé and Príncipe; and the Seychelles). Such exclusions are, for me, hard to accept, as it is likely that many players would assume that the games did not make exclusions (and, of course, the 10 Days series is marketed as an educational tool in a way the other games I have addressed are not). Geographical Note: We strove to accurately represent the political boundaries of Europe in 1901 and preserve the cities’ common name in their local language at that time. For gameplay purposes however, we were forced to slightly adjust the position of certain cities on the map. It’s not necessarily for the player that this is of the most value: I’m sure many will never have read this, buried in the credits as it is. However, for the creators to include this phrase means the issue of accuracy, and its achievability had been in mind in creating the game. If all designers utilizing real-world material made themselves produce such a statement, I can only imagine it having a positive impact upon their work, and upon the learning experience their games would provide. I wrote similar thoughts about Fauna in my review on the Geek. I was linked here by a respondent. Good article, thanks for the read. Thanks for letting me know about your review. The level of inaccuracy in Fauna sounds quite considerable. Certainly I’d be irked by the strange naming of regions on the map. Interesting read. I have Ten Days in the Americas and its rulebook includes a caveat about islands that are too small to be depicted separately on the board. Not sure if anything similar exists in the other Ten Days… games. Your posts seems to focus too much on the micro level on the effects of accuracy when if you stepped back a bit and looked at learning in games from a macro level, you might be more forgiving. The game of Risk serves well to illustrate the point. Kamchatka technically is only (well mostly) the Peninsula portion on the map, not the entire Eastern Coast. So, factually it is way off (Mongolia is even worse since it has no coastal region). I would argue though that these inaccuracies are almost irrelevant as Risk has probably taught more 10 year old boys that there is indeed a region in Russia known as Kamchatka. So as a teaching tool, despite the inaccuracies a pedagogical curiosity can be achieved. So while Risk fails on the micro level, it actually does quite a good job on the macro level of help to introduce concepts of learning. I think these thoughts are valuable. I guess what is labelled as Kamchatka in risk could simply have been called ‘Eastern Russia,’ or something similar, but Kamchatka adds a good deal of flavour, albeit its use is imprecise. The point you make about rousing curiosity is also an important one. I suppose this is where it’s important, to me, how immediately apparent a game’s factual inaccuracies are: the Risk map is, I think, clearly rough enough that the player should be aware that if he or she wants solid data, he or she has to look outside the game. The 10 Days games I’ve come across are not as evidently approximate, and thus this is why I worry more about the liberties they take.